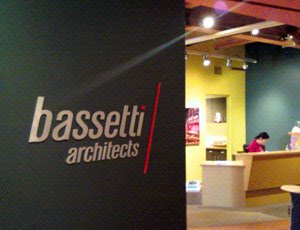 At Design Hovie Studios, we've recently finish the new logo/brand for Bassetti Architects. It was a great project and I had a lot of fun working with their in-house marketing department. Great collaboration. It's especially nice to walk out of the elevator and see the logo front and center on their entry wall!